Tattoos are a hugely personal choice. Many people get them to remember loved ones or commemorate something important that they’ve experienced. 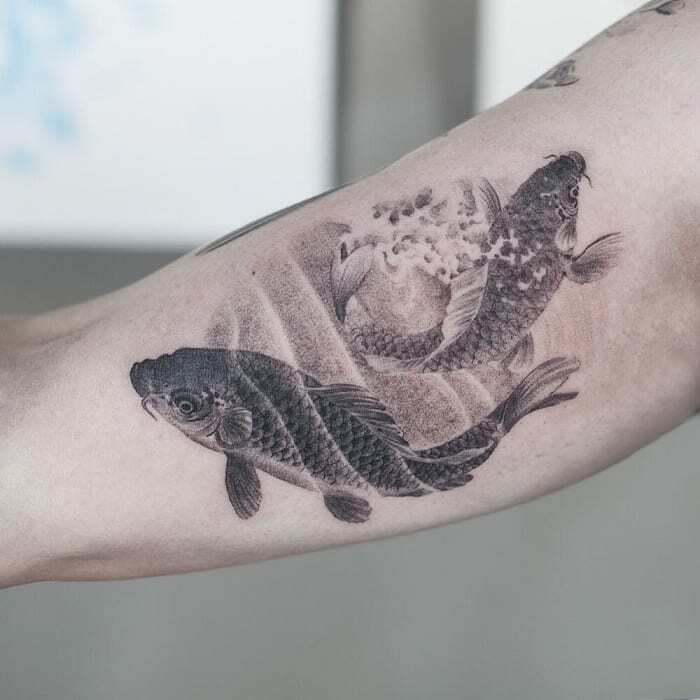 But tattoos can also be beautiful art, a way of decorating your skin. And truly talented tattoo artists are able to make some seriously amazing creations. The coolest part is that there’s literally no limit to the ways that you can “design” your skin. Sure, you weren’t able to choose the color of your eyes or your hair or even how tall you are. But if you want a phoenix rising out of the ashes on your shoulder blade? 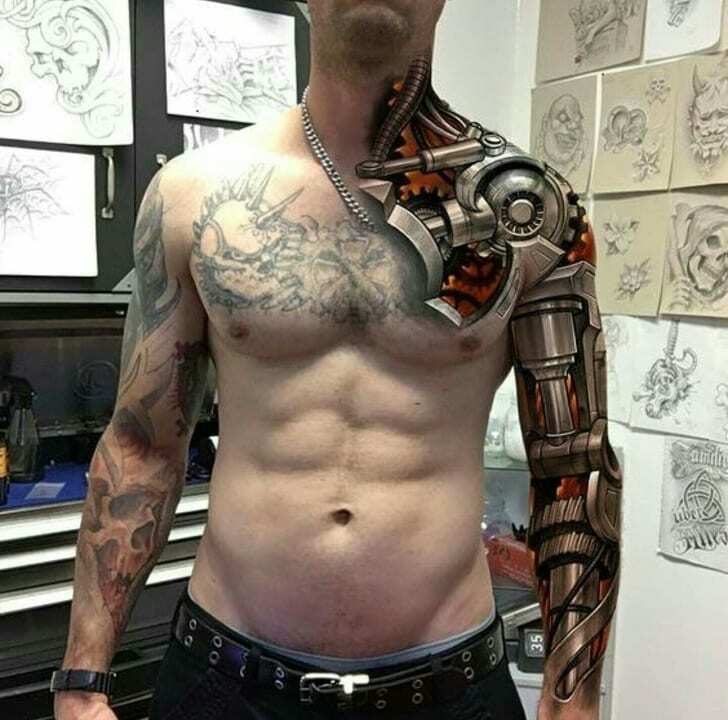 A great tattoo artist can make it happen. 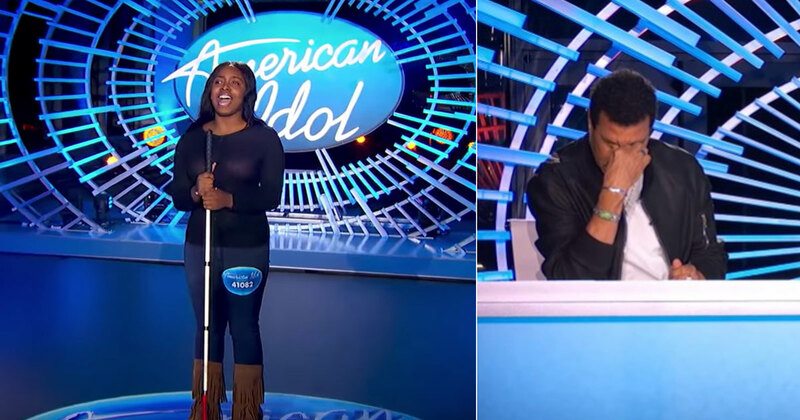 Some people get tattoos they end up regretting. Either they look terrible or even worse, there’s an awkward misspelling in the text. Just search online and you’ll find hundreds of pictures of tattoos that the owners regretted as soon as they got them. 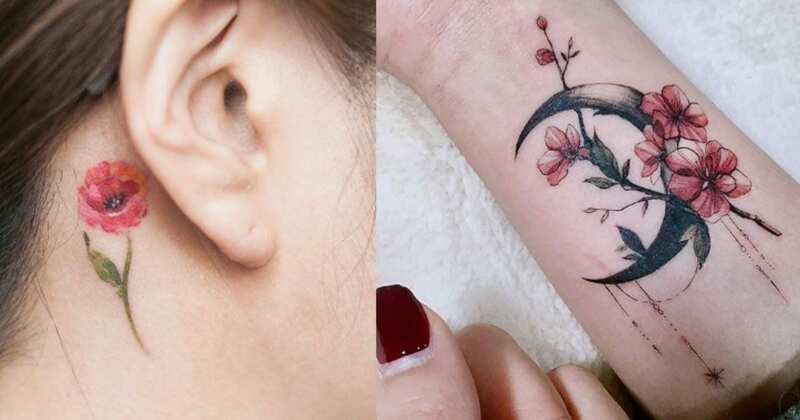 These ones, on the other hand, are tattoos that the artist got right. In fact, these went so right that you might as well go ahead and call them works of art. And that means something even cooler: these 30 people were an artist’s canvas! 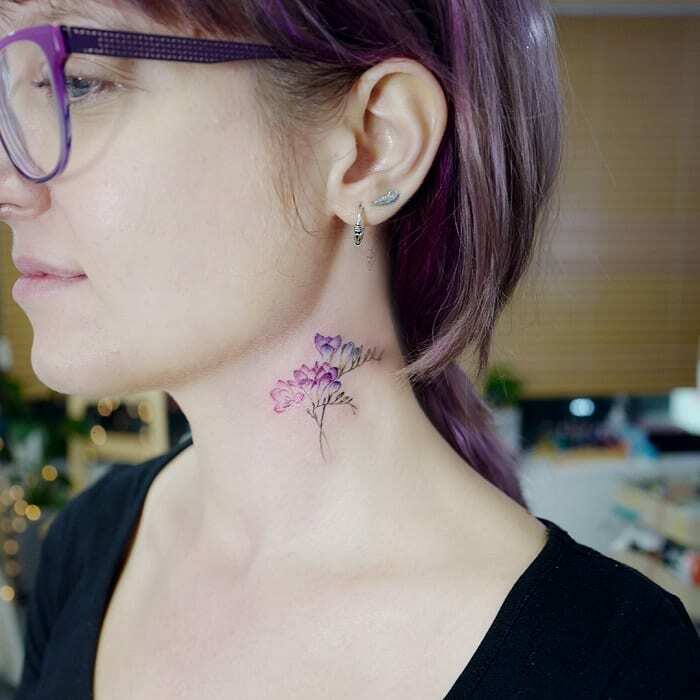 This woman has a branch of beautiful flowers inked along her collarbone in a soft retro style. It must look striking when she wears strapless dresses. It’s such a simple design made complete with a few soft pink roses, green leaves, and small purple flowers. But in ink, it’s really eye-catching. 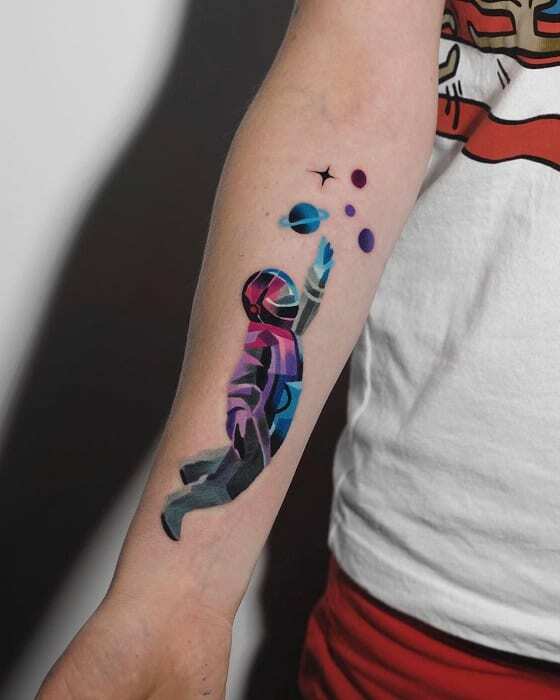 The colors the tattoo artist chose for this design are so unique and spell-binding. It’s such amazingly delicate work that you can only imagine how much talent and focus went into a tattoo this detailed. You’d almost expect to see a design like this in embroidery, but definitely not in ink! 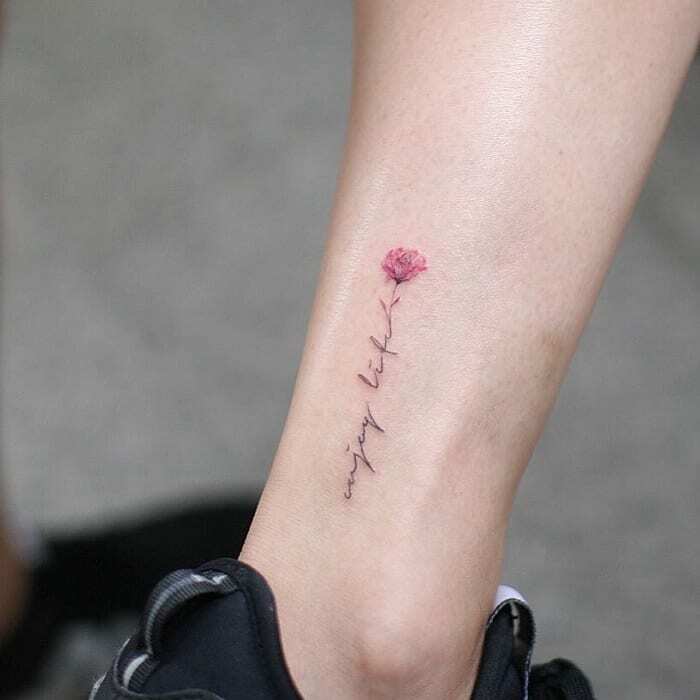 Talk about eye-catching: this single rose tattoo is striking in its simplicity. 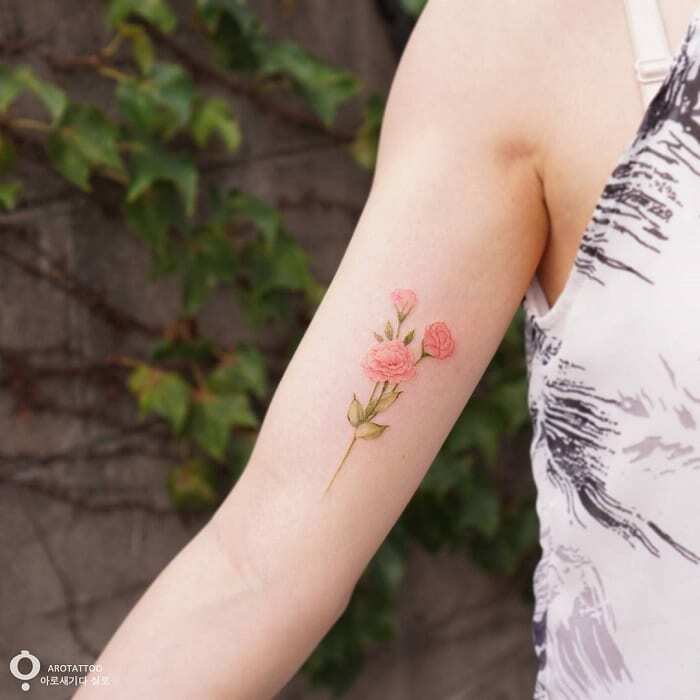 It’s such a beautiful, delicate tattoo that won’t be noticed unless its owner wants it to be. In that way, it as practical as it is stunning. Look how much detail the artist put into the design, down to the various colors on the leaves. 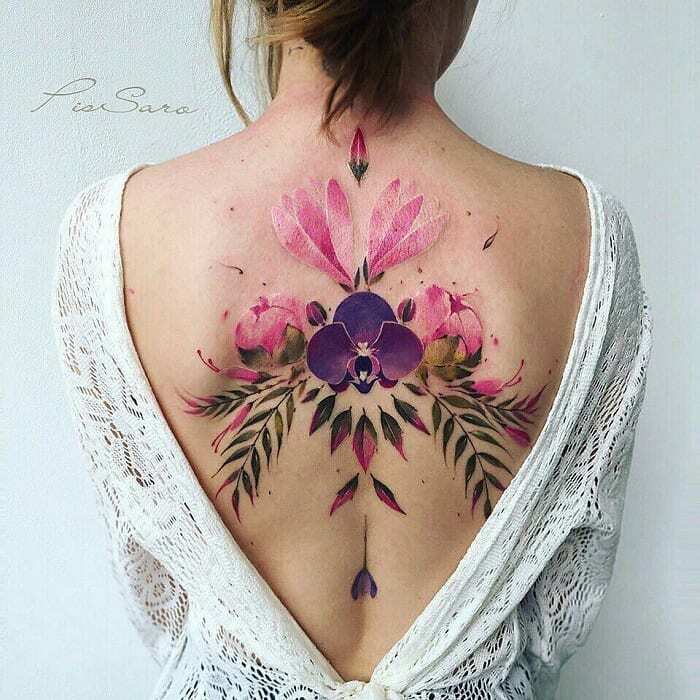 This tattoo artist has a really distinctive style that almost looks like geometric patterns represented in organic designs. These beautiful flowers are full of blocks of color that alternate between dark and light for a really striking and unusual look. The ink also catches the light in a really amazing way! Carnations are flowers that don’t get as much love as they deserve. 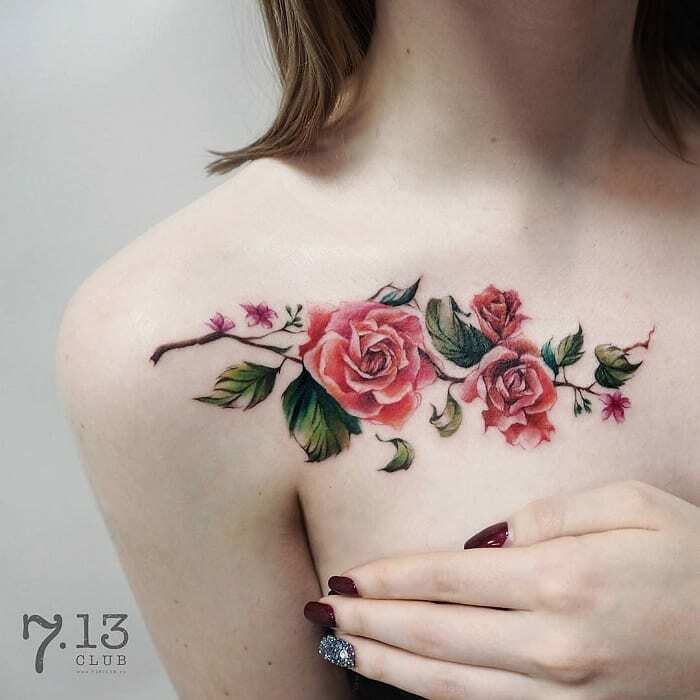 There are so many tattoos of roses, but this one catches the eye because it’s not a flower you usually see. The artist got it exactly right, from its frilly petals down to the sections on its stem. 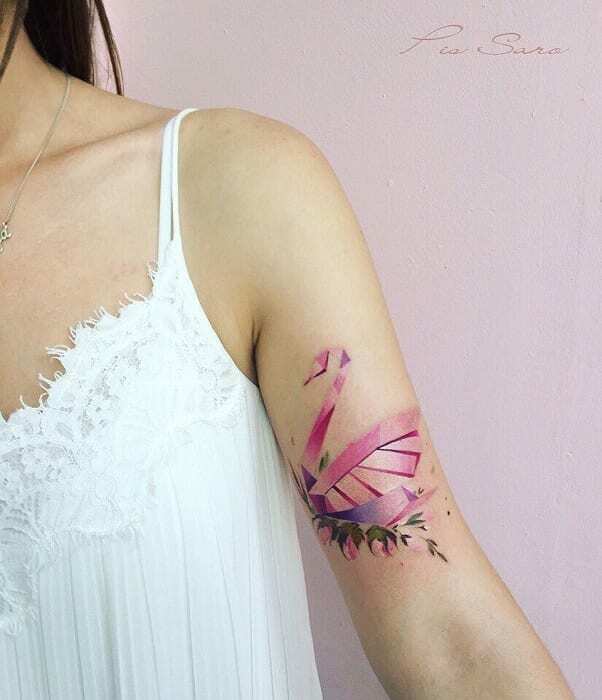 It’s not just floral tattoos that can be absolutely amazing. 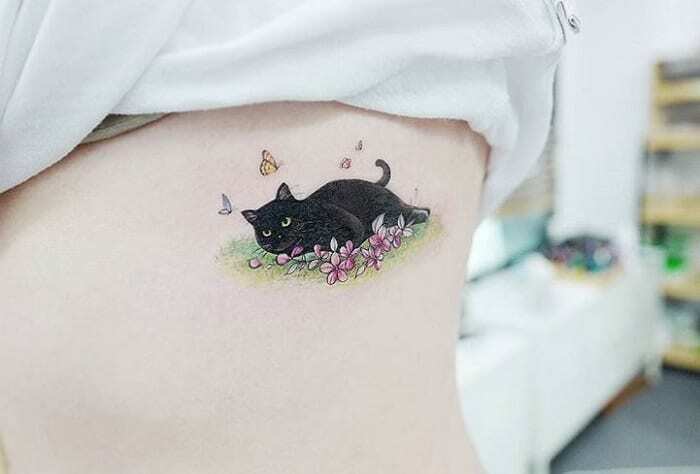 Just take a look at this adorable kitten design. Sure, there are some flowers and butterflies there for kitty to play with, but she’s the focus. It just goes to show that you don’t have to get a classically perfect tattoo for it to be gorgeous. 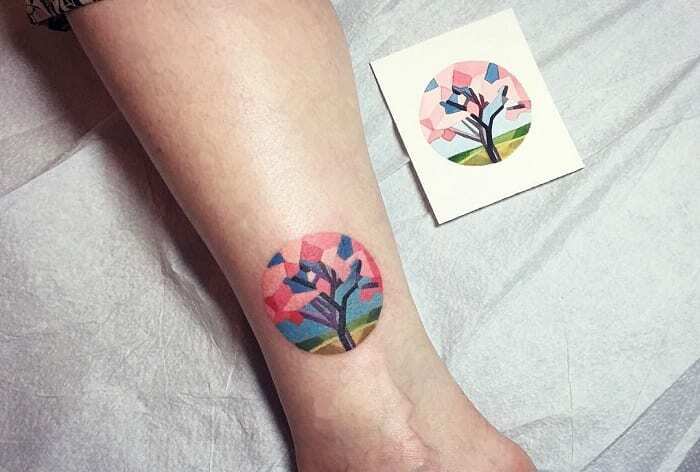 This abstract geometric design is obviously a picture of a tree in front of a field, but it’s working with a colorful block style that’s really unique. The effect looks almost like a stain glass window. It’s such an amazing talent to be able to capture that effect with ink on skin. It’s not exactly clear what kind of flowers those are. They might be a cluster of pink roses, but they look like they could also be carnations or maybe even peonies. But at the end of the day, it doesn’t matter what the artist intended them to be. They’re a beautiful piece of art. 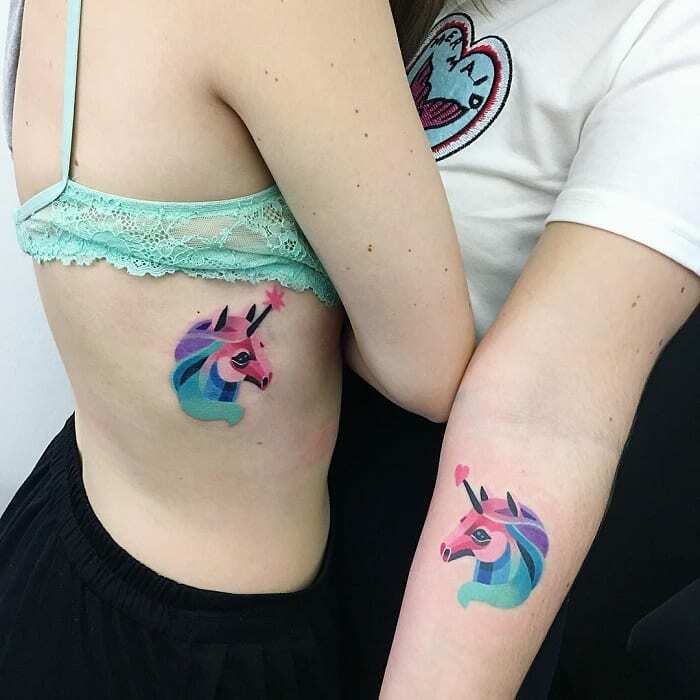 Here’s a unique idea for a couple’s tattoo: matching rainbow unicorns with their horns piercing tiny shapes. While one has a unicorn with its horn piercing a heart the other’s tattoo is piercing a star. The two pieces have a distinct look almost like stained glass. 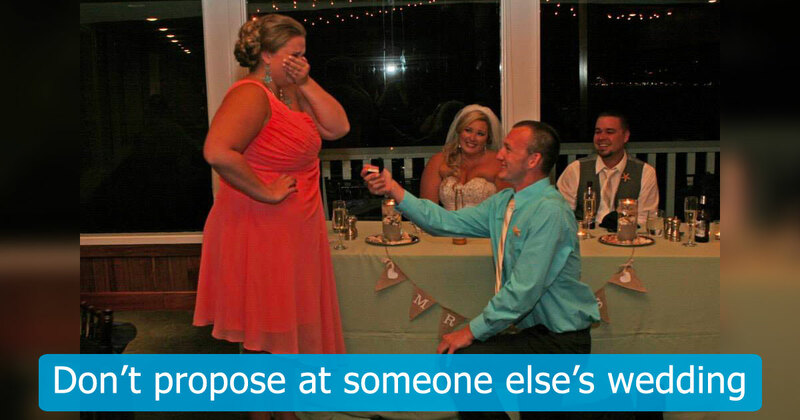 They’re beautiful tattoos all on their own, but together, they’re truly amazing. 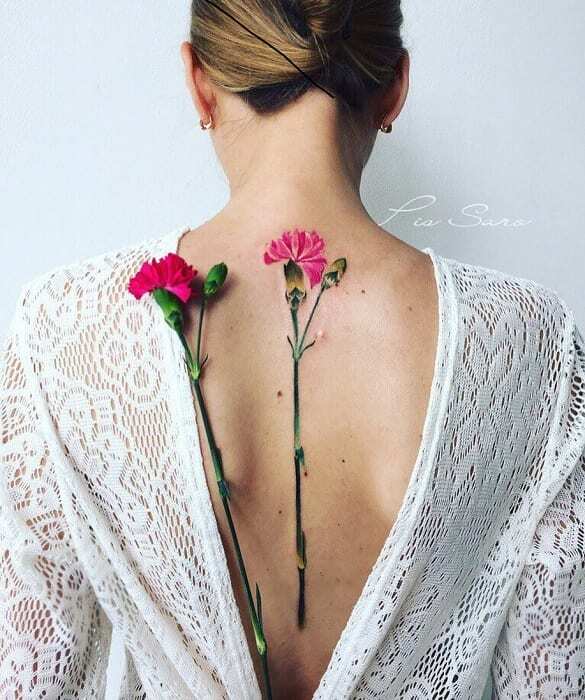 This one is a little more unconventional for a back tattoo, but we’re absolutely loving it. If you’re struggling for ideas, why not get a beaded hot air balloon erupting in pink flowers? 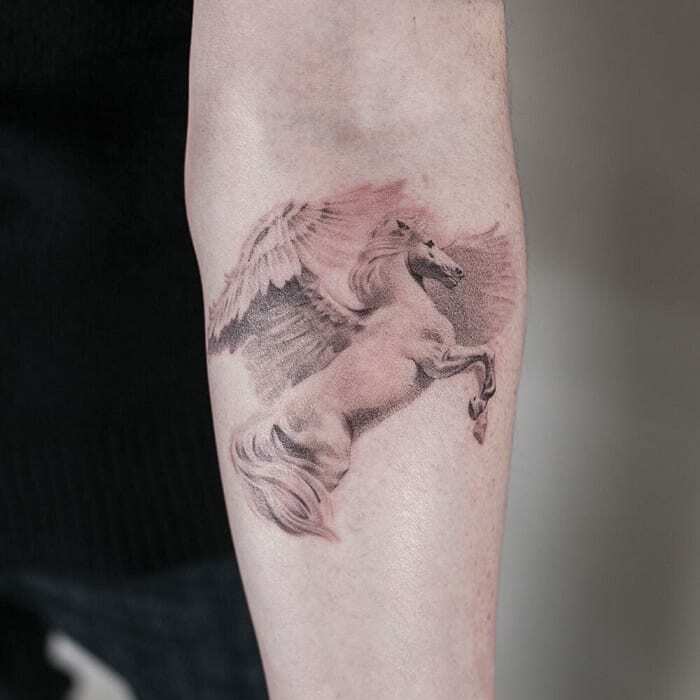 It looks so elegant, almost like an illustration in a book, and it’s a perfect example of how tattoos can be classy. Not a lot of women choose to get tattoos on their chest, especially not their sternum. But this woman has gone all out with an absolutely gorgeous tattoo of a big blue flower. With its delicate shading, it looks as though it could be straight out of a Van Gogh painting. 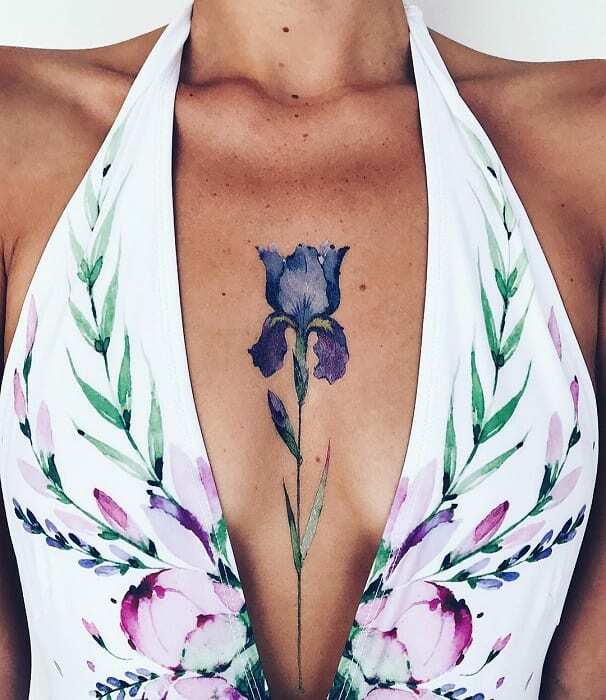 This model might have a purple tattoo, but her love for the color clearly goes even farther: she’s also sporting purple hair and purple glasses. 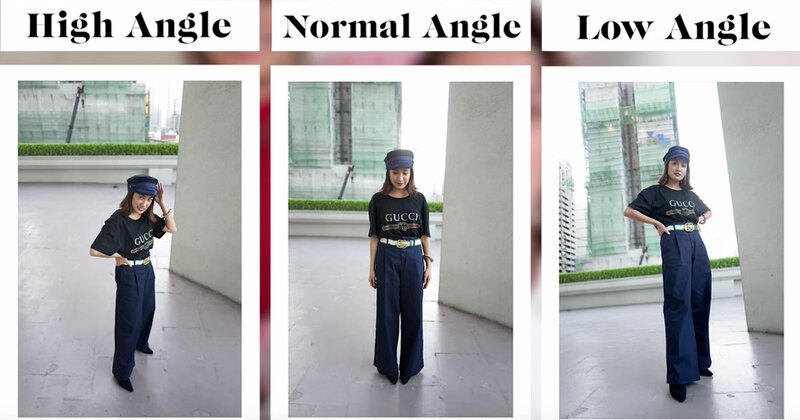 It just goes to show that unusual fashion choices can be elegant and feminine even if they don’t have that reputation. She looks absolutely gorgeous. There’s definitely an entire story unfolding in this tattoo. From the autumn leaves falling to the ground to the shapes hovering in the air around them, there is more we need to know about these cats. But we only get one thing: each of them thinks the other one is pretty great. Talk about subtle and beautiful. 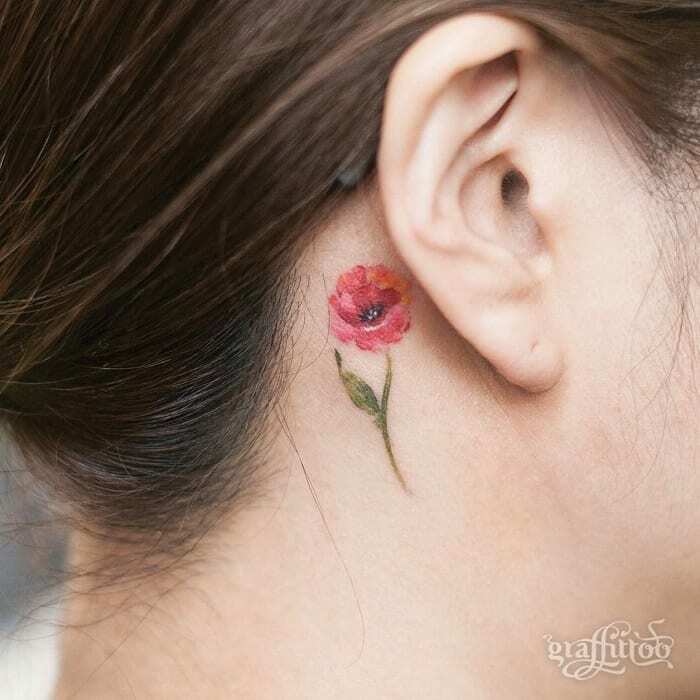 This woman has a colorful flower tattoo that’s just barely visible behind her earlobe. It’s a perfect way to combine something that’s bold, bright, and beautiful, with something delicate and modest. 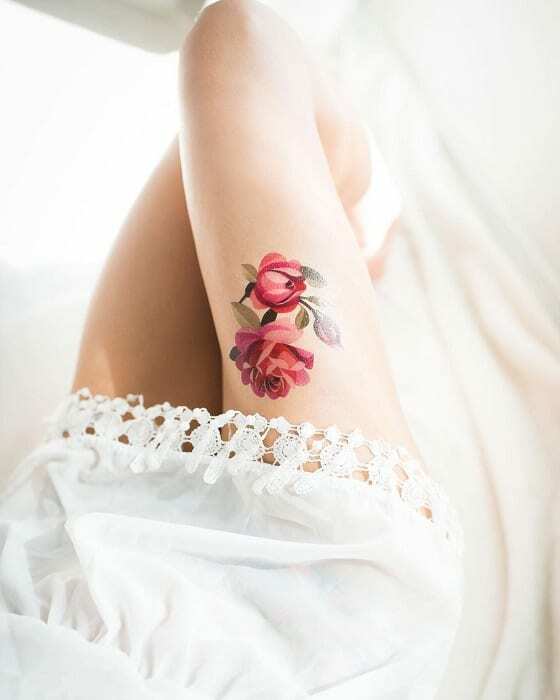 Plus, it’s the perfect way to dress a tattoo up or down depending on where you are — just push your hair forward to cover. 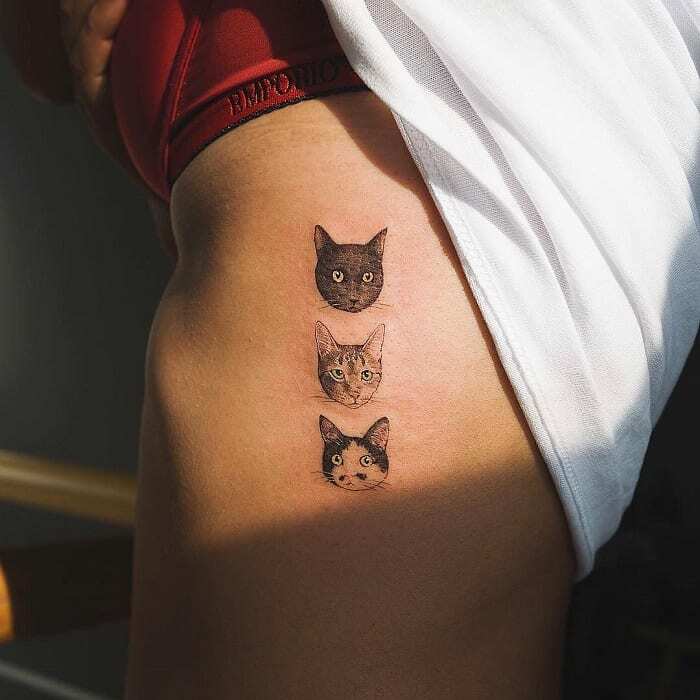 Apparently getting tattoos of cats is more popular than you’d ever think. This man has a highly-personalized group of cats on his arm. We wonder if these are his cats and he’s got a whole bunch of furry friends back home. After all, cats and men with big muscles are a perfect combination. 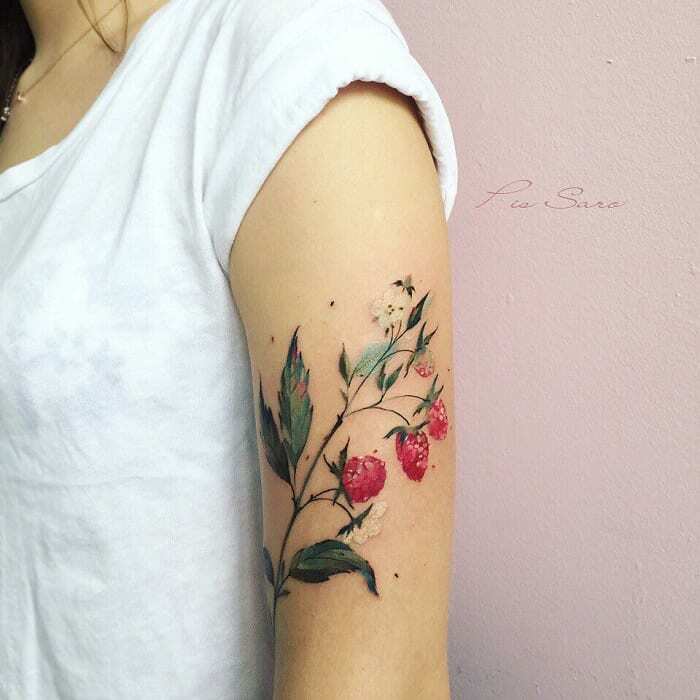 Forget flowers: if you want a tattoo from nature, get a cluster of bright red berries. 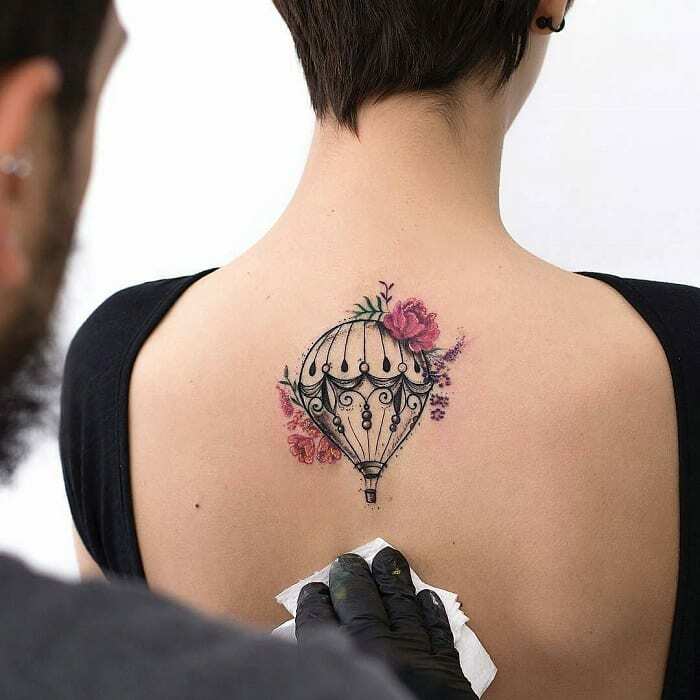 It’s another example of finding beauty in unconventional things, and for tattoos, it works surprisingly well. There are a couple of soft white blossoms on there too to set the whole thing off. 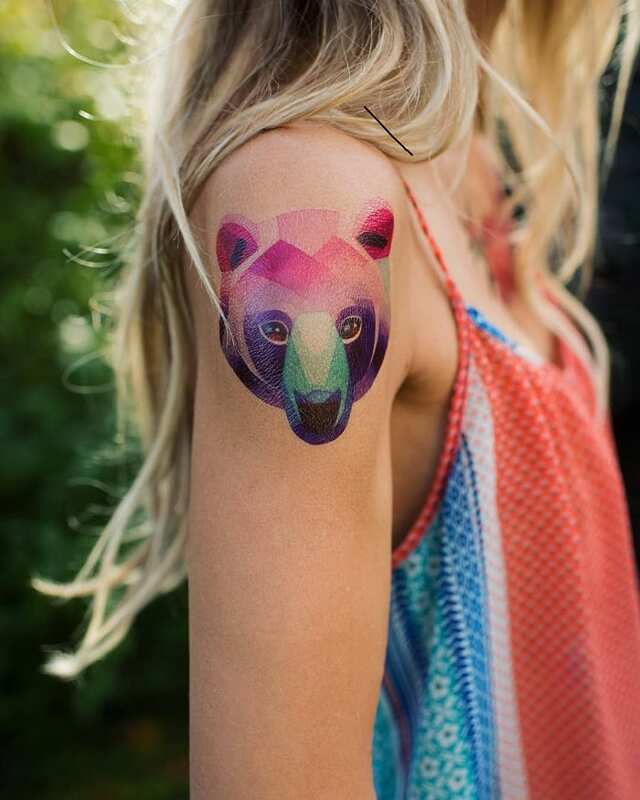 This beautiful bear design is super colorful, but that’s not the most amazing part. Instead, just look at those big brown eyes. They may not be every shade of the rainbow, but they’re so lifelike that you can’t help but stare. The artist captured that expression in a way that’s mesmerizing. It’s not just tiny things that are beautiful. This woman has a huge, elaborate floral design across her entire back. 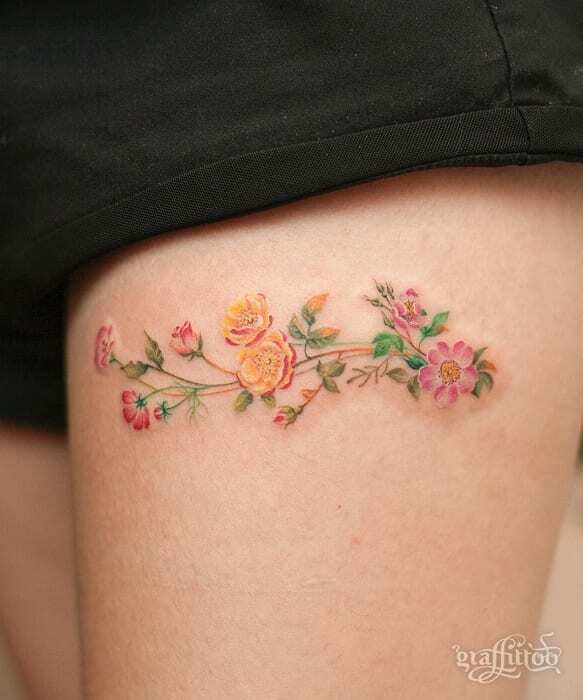 There are so many elements to it, from the colors to the intricate shading on the petals. 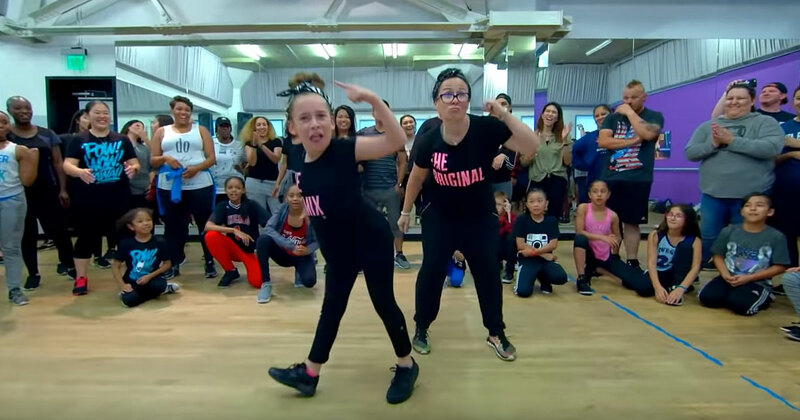 It’s obvious this is an art form that takes a lot of talent to perfect. Some art has meaning because of the message behind it. In this case, there’s a message actually written out: “enjoy life.” The tattoo artist has brilliantly combined art and calligraphy in this design. What a good reminder to have right there on your arm for times when you’re in danger of forgetting! 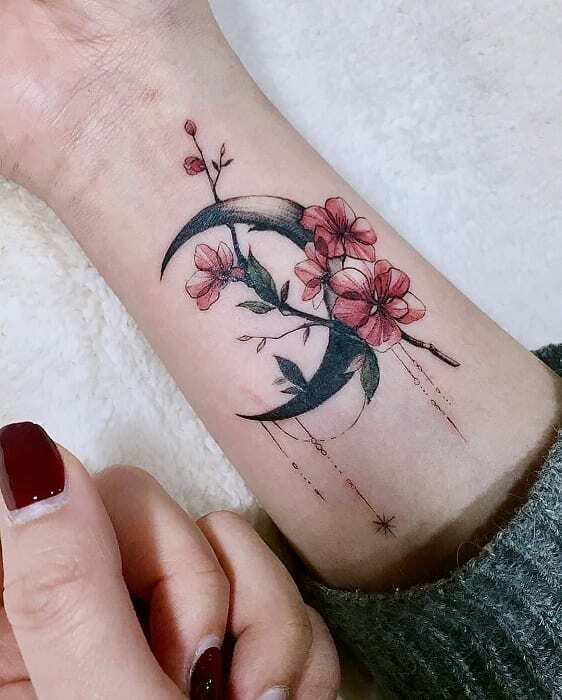 There are so many colors contained in this one tiny tattoo. It must have made for some incredibly delicate work on the part of the tattoo artist. 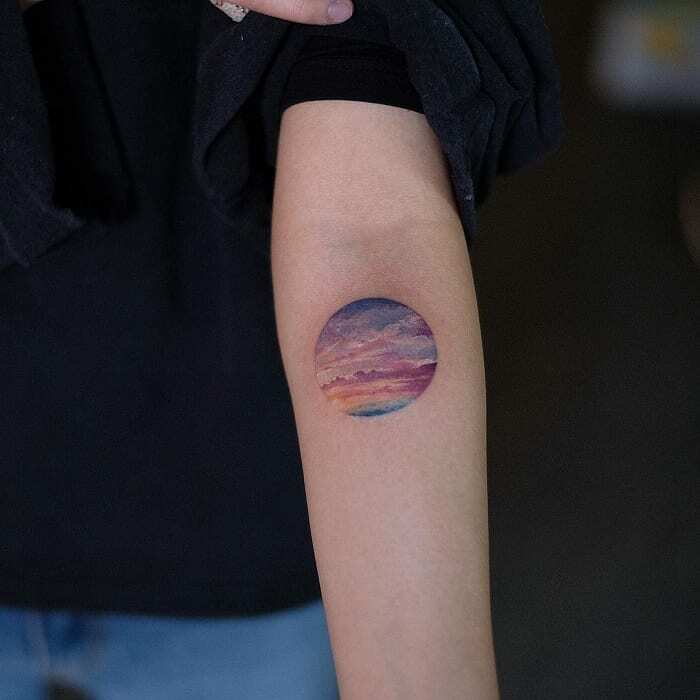 Imagine having this beautiful picture on your body to enjoy any time of the day! It must be impossible not to look at. This tattoo might not be in color but it’s still just as eye-catching. It definitely tells a story, too, even if we might not know exactly what it is. Just like with any piece of art, you’ll have to use your imagination and make some guesses about what the artist is trying to say. 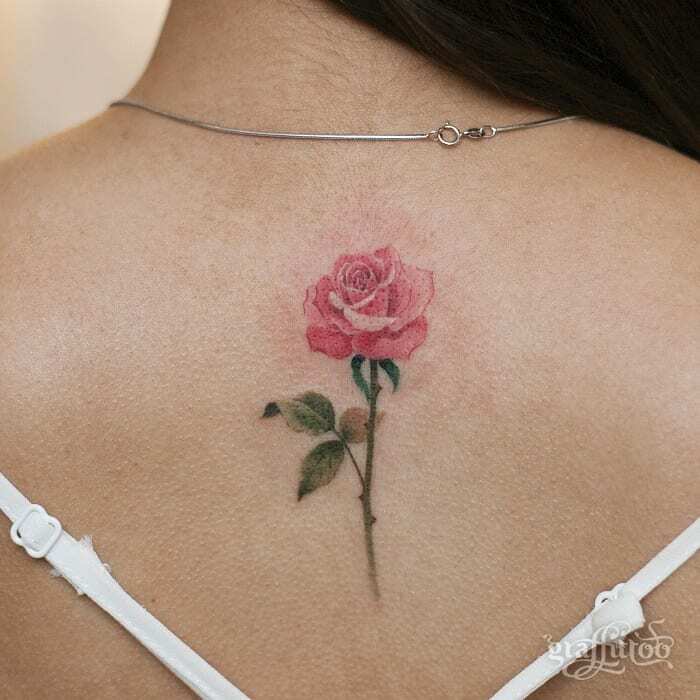 Here’s another example of a tattoo that might be big, but it’s still delicate. Just look at this amazing elephant with its colorful ears. 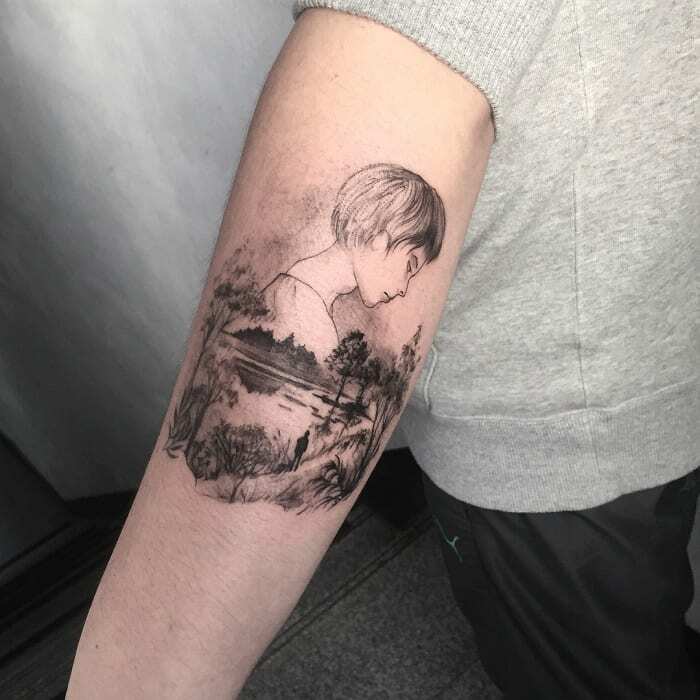 The tattoo artist did a great job of combining duller monochrome colors with jewel tones to make the shades of blue really pop off the model’s skin. People use the term “face tattoo” to describe something that’s unattractive, distracting, and trashy. This model is the perfect example of how face tattoos can actually be beautiful. 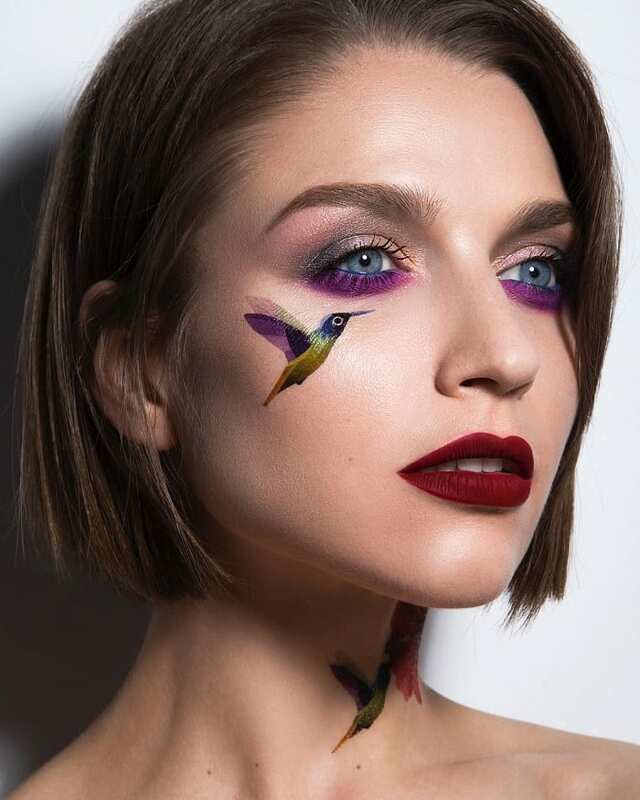 Her colorful hummingbird is set off by her vibrant makeup in a beautiful way. 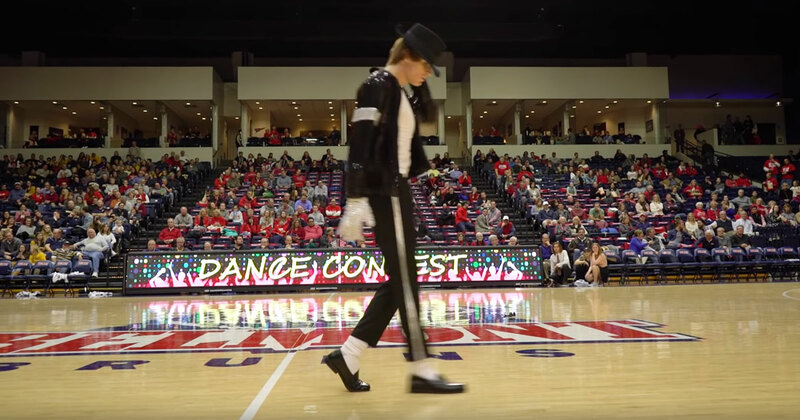 It’s mesmerizing, to say the least. 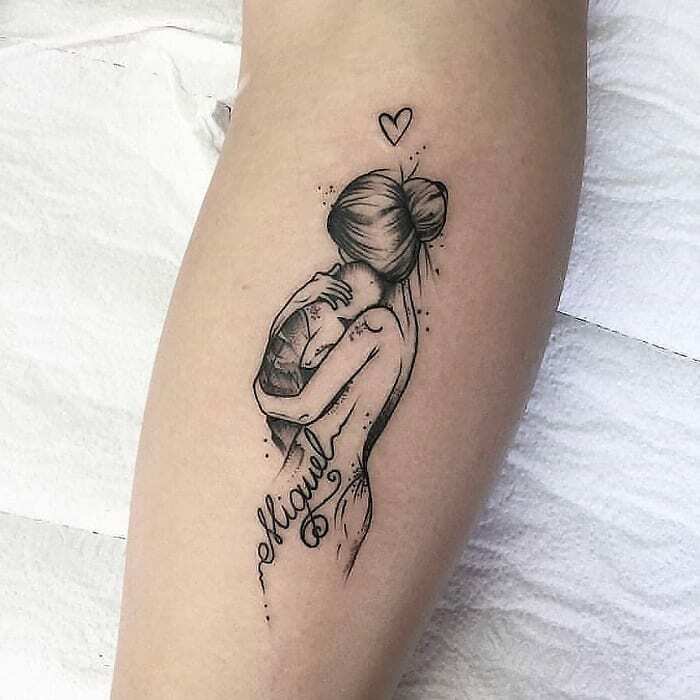 This would be such a meaningful tattoo to a mother. The woman is depicted with messy hair and without a shirt, holding a baby wrapped in a blanket with the name “Miguel” beneath them both. You can imagine she was up pacing the floor all night, exhausted but still totally in love with her baby. 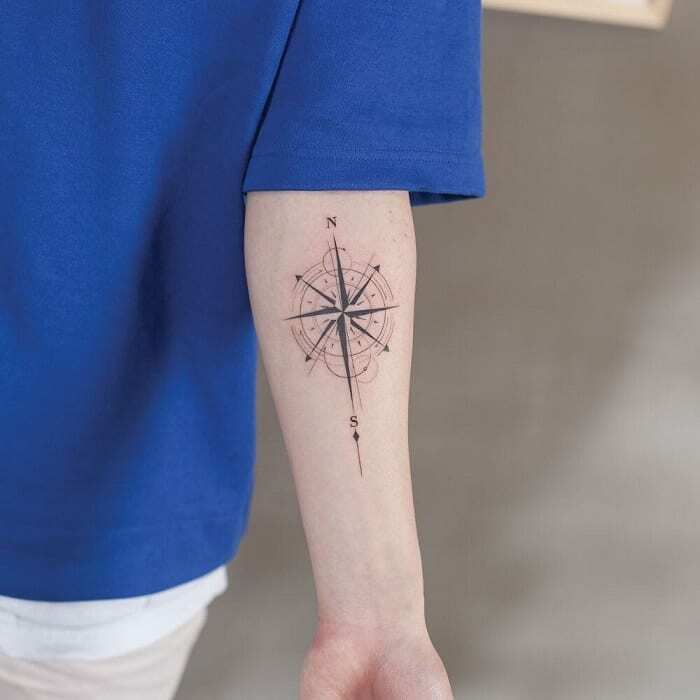 Unfortunately, it won’t work as a real compass (wouldn’t that be cool?) but it’s definitely an amazing design. The individuality and intricacy go to show how things like compasses are much more than just tools. The tattoo artist totally put their own spin on the design, pun intended. There’s an old saying: “Reach for the moon. 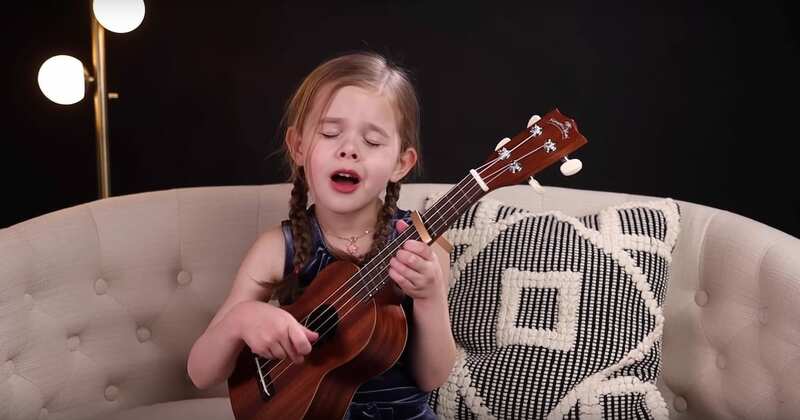 Even if you miss, you’ll land among the stars.” This little astronaut is reaching for the planets, arms outstretched into space. You can decide for yourself what that means. Maybe it’s about adventuring bravely out into the unknown? 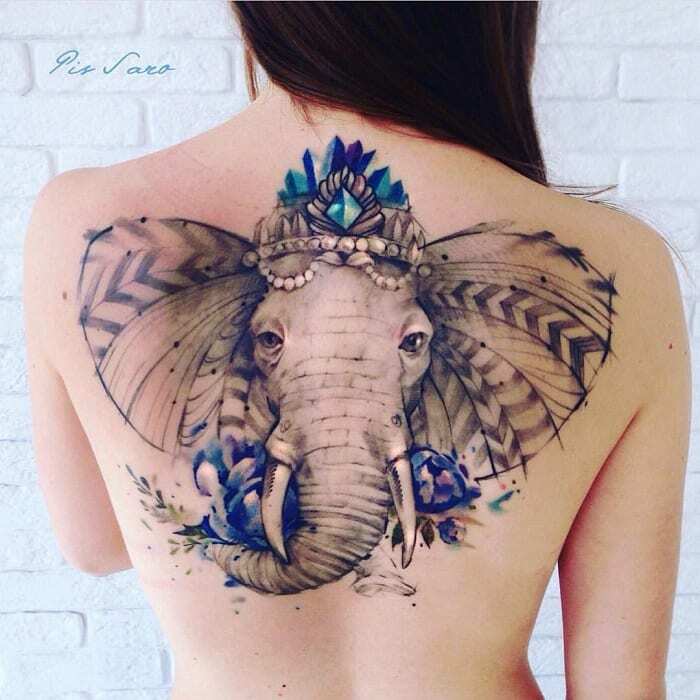 This tattoo artist has a really distinctive style that pops in this design. There’s no doubt you’d do a double-take if you saw this on someone’s arm. There’s so much attention to the shading on different parts of the swan! It’s subtle but full of detail. 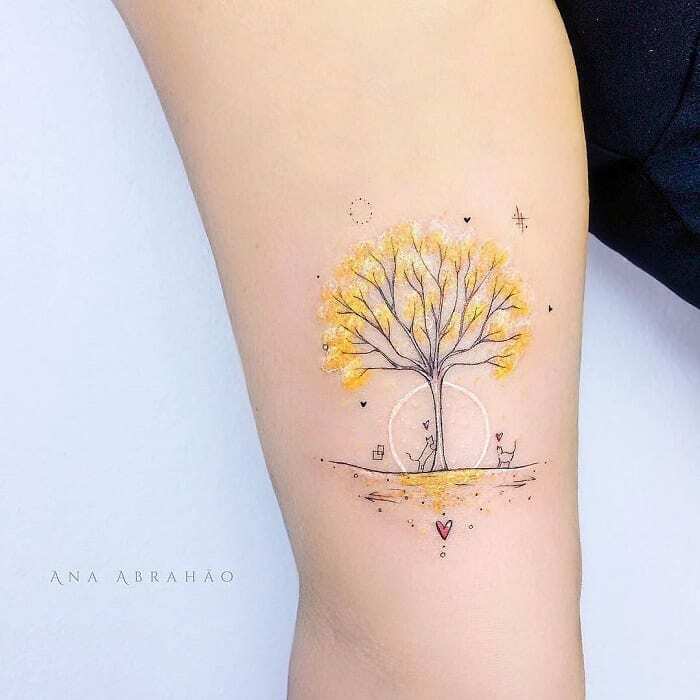 This dark, rust-colored tattoo looks almost like it could be an illustration from a children’s book. There are so many beautiful tiny details, from the color movement on the moon to the beads dripping from the bottom of it. It just goes to show how much thought goes into making designs like this. This tattoo artist did an amazing job of painting a beautiful picture all in shades of gray. This koi looks so lifelike, you’d almost expect to see them start swimming, though that would be pretty alarming. It’s amazing that the artist could capture something so realistic in ink! Unicorns may not be real, but this one looks as if it could almost jump right off the model’s skin. Its huge wings are spread out in flight and it’s rearing up with its front legs in the air, ready for takeoff. What a beautiful picture with so much detail, even in monochrome. 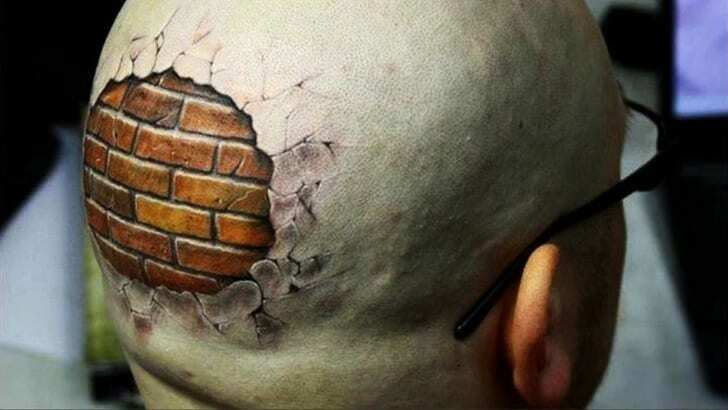 This 3D tattoo is the definition of bold. It really plays tricks on your eye! 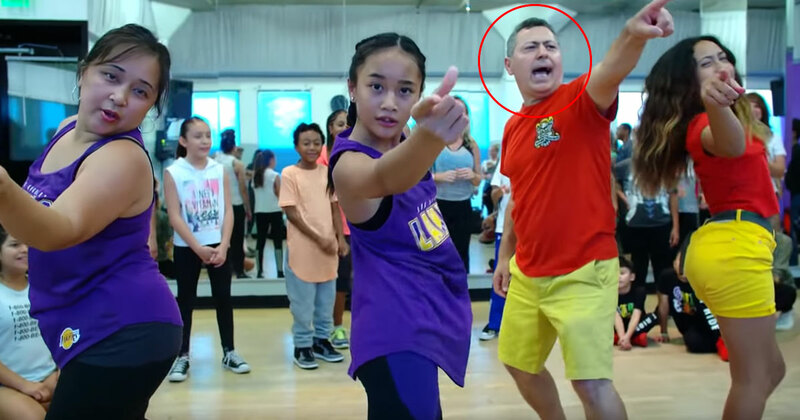 This man’s arm makes you do a double take. It really looks like he is a robot!